Looking for a unique specialty gift for pet lovers? 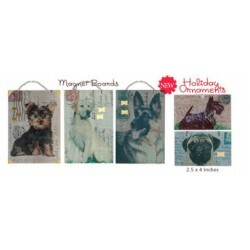 These vintage postcard magnet boards and holiday ornaments are the perfect gift for pet lovers. This large selection of breed-specific images features hand selected vintage postcards with stamps from the breed's country of origin. Each magnet board comes with a ribbon for hanging and magnets chosen to reflect the animal theme. All boards can be personalized on the back with a permanent marker.